I am coming up on my fourth anniversary in creative business, and I’m proud to say that I’ve turned my hobby into a successful work-at-home career. 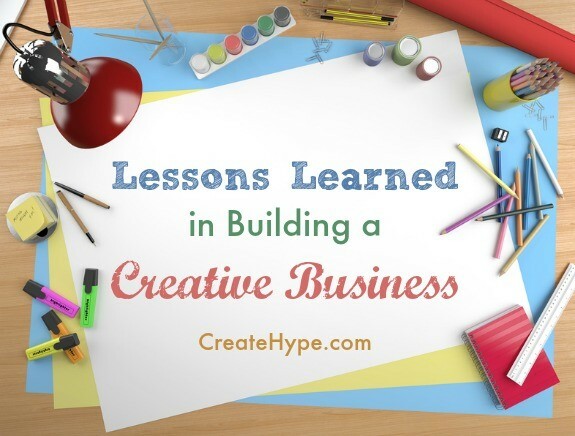 Here are a few important lessons I’ve learned about building a creative business. I rarely think of “competition” unless I’m writing and I have to reference the traditional definition of the word. I truly believe there is room for everybody and every business to have abundant success. I don’t waste any time looking over my shoulder, and this keeps me working full steam ahead. As part of my marketing research, I have identified a few role model businesses in my field. I choose bigger businesses with independent websites (in other words, I stay out of the handmade marketplace). Doing so reduces the temptation for comparison. For example, when I study my role model businesses, I see them taking full-page advertisements in magazines. Those ads cost tens of thousands of dollars, if not more! While print advertising is still out of my league, I always have Facebook. How can I reach the same market on 1/1,000th of the budget? I can create a Facebook ad to target those who “like” the same magazine where my role models print advertisements. I can reach the same audience at a fraction of the cost. You want your customers to always count on your brand to be everything they expect or more. For example, I’ve eaten at McDonalds in Pittsburgh, Paris, and Porirua (NZ). No matter where you are in the world, the hamburger is the same. Customers have learned to trust that their experience with McDonalds is always going to be exactly what they expect it to be, and it’s quite comforting to buy with a sense of familiarity already established. When I opened two shops, I knew I needed to assure my customers that wherever they shopped, they could expect the brand they’ve come to trust. The Energy Shop needed a logo, and I finally hired a graphic designer to help me build one that represented everything I believed about the Energy Shop. That logo now appears everywhere my jewelry is displayed, and my customers become more familiar and comfortable with the business every time they see it. The first three years of business is just planting the seed. Like anything else, you have to start at the beginning, and the beginning of business is always laying the foundation for a promising future of growth. That’s just realistic, and most people don’t come in expecting to pay their dues. This is just one of the reasons you’ll hear so much moaning and groaning in the handmade forums. People want success yesterday already; but if you enter the marketplace prepared for the long haul, you’ll survive: outwit, outlast, and outsell the complainers. When I write to help inspire your business, I almost always share my sunlit side. Over the years, I’ve lost count of how many times I’ve felt like giving up. Just keep going. You can do this! Lisa, you are so inspiring and a terrific business role model! Anytime I need advise for growing my online business, I seek your many resources first! Perseverance is so important! Both when we are in the process of creating (for me, it is painting), and when it comes to the business side of things. Nice to meet you, Lisa. Patience is the one thing I am proud to say I have which is just as well as after quite some time now I am finally finding my niche. I have a long way to go yet and hearing from someone who has been there, it is nice to hear that the hard work will pay off in the end and as with all things, it does not happen overnight. When people ask me ” how is it all going” I reply, not too bad, I want to say its doing great and will do one day. love love love this from beginning to end! thanks for this I may just print it out and hang it up to remind me when I am so hard on myself!!! THANKS FOR YOUR GREAT CONTENT….love all of it!